Children’s English Language Acquisition | Propel L.A. 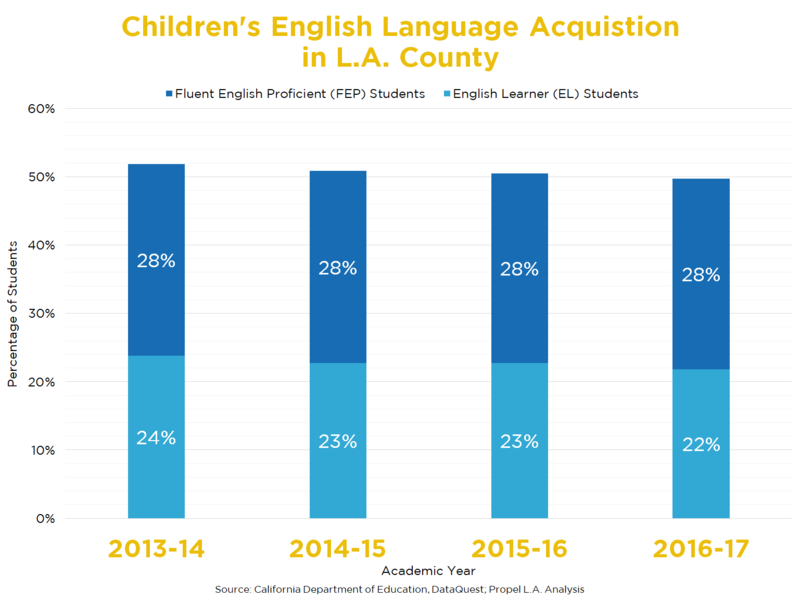 The graph displays English learner students in K-12 Los Angeles County public schools by their English language acquisition status. More than one in every five students in Los Angeles County public schools are English Learners (ELs). California Department of Education defines an EL as a student whose primary language is other than English and who has not yet developed enough English proficiency to participate in the regular school program. The assessment is based on the statewide Home Language Survey and the English Language Development Test, respectively. The percentage of ELs gradually decreased from 24% in 2013-14 to 22% in 2016-17. The decline indicates that the proportion of English proficient students is growing over time. The English proficient student population is composed of native English speaking and Fluent-English Proficient (FEP) students. FEP students are former ELs who either met district criteria for determining English proficiency or scored high enough on a state test of English proficiency. In every academic year since 2013-14, 28% of students in Los Angeles County public schools were FEP.